Use Free Video to MP3 Converter to extract audio from video files to MP3 and WAV Lossless Audio (*.avi, *mpg, *.mpg, *.mp4, *.m4v, *.mpeg, *.dvr-ms, *.wmv, *.asf, *.mov, *.qt, *.amv, *.3gp, *.3g2 and *.flv). Lossless Audio (WAV, 44100 Hz, STEREO). For example convert avi to mp3, mp4 to mp3, wmv to mp3, etc. 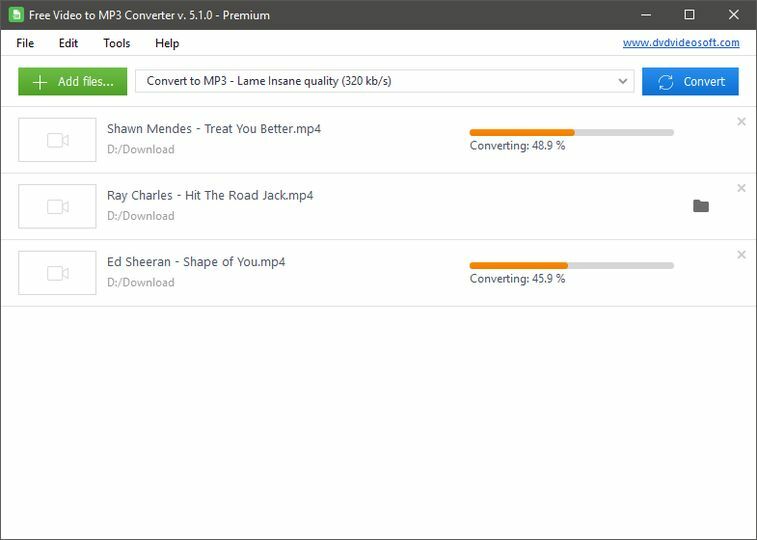 Free Video to MP3 Converter automatically fills the title tag and the artwork, taking a snapshot from the middle of video, which can be seen in iTunes, Winamp or just a Windows Explorer folder. Free Video to MP3 Converer is clearly free. No adware or spyware. It's safe to install and run.